I started writing a blog about Mothers’ Day, much like most people blogging today, I’m sure. But I just couldn’t get into a rhythm to write about anything substantial about mothers, mine or anyone else’s. So, please bear with me, and know that this was obviously what needed to get out today. Happy Mothers’ Day to all the mothers out there, and to all the fathers who fill that role, too. My mom has always been there for me, although I didn’t always realize it. I’ve always loved her, but truth be told, sometimes I didn’t always like her and I certainly didn’t get her. My younger years were spent thinking she loved my brothers more than me, my teen years were rough when I thought she was too harsh or too old (which is laughable now! ), and my early years of marriage and motherhood were sometimes strained when I thought she was out of touch and occasionally intrusive. Somewhere along the line, though, I suddenly understood who she was and we fell into this friendship we have now. I’ve come to count on her more and more in recent years, and at this point right now, this period of loss and grieving, I’m extremely thankful for her support. Losing my husband has been an absolute blow, and my mother can relate. She was only 5 years older than I am now when my father suddenly passed away, and so she understands the special challenges I’m facing. Of course, she was in a slightly different place; two of her three children were married, she was already a grandmother to all but one of her grandchildren, she was only a few years away from paying off the mortgage on her house, and most importantly, Daddy had a life insurance policy. Her financial future was much more stable than my own. Fortunately (or unfortunately), not much has changed on that front for me. My husband didn’t have an insurance policy because it was one of those “unnecessary” expenses that we had cut out awhile ago. He had quit his job several years ago to pursue a dream, so I’ve been the breadwinner for awhile now. I encouraged him to do this because I never wanted to be the one to quash his dreams. I didn’t want us to grow old and wonder “what if”. What if he had never tried? What if he missed his chance? What if we were destined for something more, but we waited too long? I remember all the things my father was going to do when he retired, but never got to. He kept putting off his dreams because he had to be the responsible one; it was simply the way things worked in his generation. My mother had worked part time out of the home and when Dad passed away, she tried to get a “real” job, a full time job that had health insurance because suddenly she found herself without. She hated it and it was so hard on her to not only grieve my father’s passing, but try to learn new skills when her thoughts were clearly elsewhere. So after a short while that ended and she went back to working her part time job as a companion for a woman in a wheelchair, who also happened to be a friend. My employment situation is exactly as it was a month ago, which means my financial situation is exactly the same, as well. I’m lucky in that respect as I don’t have to wonder if I have enough to pay my bills. My budget is the same budget I had two months ago with a few unexpected short-term expenses related to my husband’s passing. When my son goes off to college next year, I’ll likely have to make some adjustments. It won’t be easy, but I know that I can and will do whatever might be required of me. And I will be OK.
Knowing the end result, some might say that my husband leaving a steady paycheck for the unknown was extremely foolish. Some people would probably say that even if it hadn’t ended the way it did. I look at it differently. Even though his dream never came to fruition, I see the past eight years as a gift. For at least half of that time, I worked from home and my husband and I were together all day, every day. For the past few years, we took walks almost daily and talked about everything from our kids to our past to our future. He would wait quietly and patiently when I’d discover some subject for a photography session (mostly nature photos, and generally of the creepy-crawly variety). We went almost everywhere together from the grocery store to the bank to the beach. He would cook me breakfast or lunch when I was working hard on my business or schoolwork. He was simply there for me. He was also there for our kids. He was the one who drove them to school, or waited at the bus stop with them. He was there to cook dinner. He was there to take phone calls from our girls when they were away at school and needed to talk. He was there when our son wanted someone to play basketball with or play goalie while he practiced soccer shots. He loved talking to the kids, and he loved spending time with them. He often learned about broken hearts or bad grades long before I did. Sometimes, it hurt, honestly. It felt as if I were somehow being ousted as mother. He was a better at being a stay-at-home father than I had ever been as stay-at-home mom. But then I would be thankful that if I had to be second best, I’d rather it be to him than someone (or something) else. Looking back, it seems as though their father was providing them with so many more memories than they would have had had he kept aworking 40 or 50 hours a week or more. He was involved in their day-to-day lives in a way most fathers simply aren’t. Most simply cannot be, and that’s understandable. Each family is different, and there’s no shame in doing what works best for you. We, on the other hand, have never been the most conventional couple, and we’ve been fine with it. We made decisions not always derived logically, but often based on intuition and emotion. In this case, a seemingly random (and perhaps foolish) decision ended up allowing our family to spend a lot of time together, time spent making memories that we can now appreciate all the more. 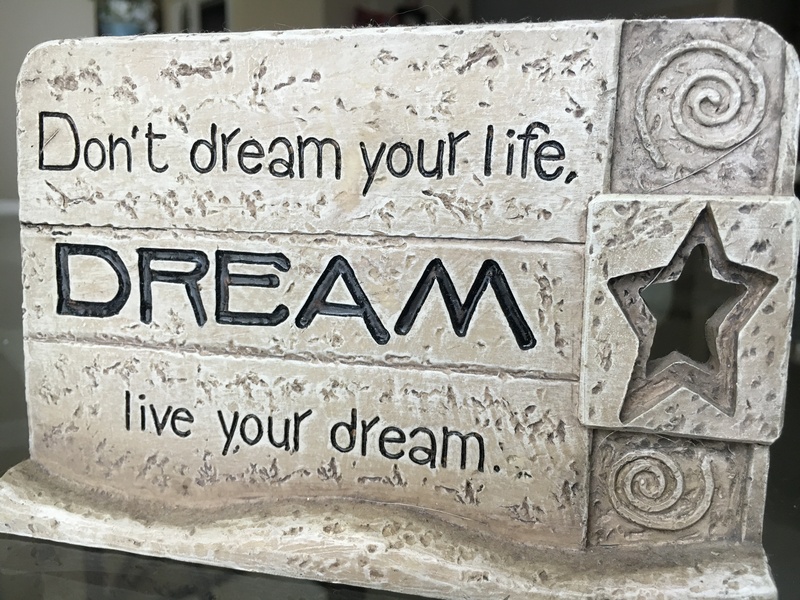 We live by the mantra found on our knick-knack shelf and have always “lived our dreams”. And for that, I am truly thankful.